All companies want to ensure their workforce remains engaged and motivated. This can only be achieved, however, by constantly investing in employee development. Many medium and large organisations invest as much as 2 to 5% of their salary budgets into training. From an inclusion and diversity training perspective, PDT Global has found that for organisations with more than 10,000 employees it may be most cost effective and practical to invest those budgets in developing their own internal solutions for cascade across the business. 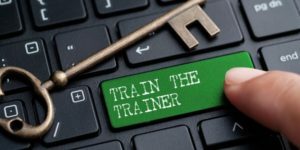 The Train the Trainer model allows participants to learn a subject matter and simultaneously learn how to teach others and in corporate environments, this method has distinct advantages. At PDT Global, our Train the Trainer solutions have been created to equip organisations with the skills to bring Diversity and Inclusion (D&I) training in house. We partner with organisations to develop their in-house trainers ensuring that they are able to facilitate informative and engaging training courses for the rest of the business. We empower them to plan impactful workshops and masterclasses around Inclusion, Unconscious Bias, Inclusive Leadership, Respect and Integrity and Women’s Leadership amongst others. Our incredibly interactive sessions are loaded with not only proven PDT Global content but also tips, tools and techniques for expert facilitation of the sessions. – Access to our repository of materials and ongoing support from our trainers. Most importantly, our expert trainers provide an inclusive training environment which enables in-house trainers to feel comfortable asking difficult questions around diversity and inclusion. By attending our Train the Trainer programmes, in-house trainers will fully develop an understanding of the relevant content as well as the training skills required to deliver a fully inclusive and professional session. Our Train the Trainer solutions are ideal for large organisations focused on building their internal training capabilities. To find out more about one of our TTT solutions, please click here. Visit our website for more information on how we are working with global organisations to help them build and embed a truly inclusive culture, or you can email us – info@pdtglobal.com.